Northview Bank is a recognized leader in recreational property financing. Whether you are looking to purchase a cabin, hunting land,lakeshore property, or a second home our experienced lending team is ready to assist you with a loan customized to meet your needs. Tax preparation,accounting,payroll, bookkeeping and business planning. Deer River Cooperative Credit Union, serving the community since 1938. Services include ATM, debit cards, home banking, savings accounts, certificates, convenient IRA’s, checking accounts, and loans of all types! We are staffed by a team of professional title and registration specialists who work one on one with you to ensure that all documents are prepared properly from start to finish. No one can match our precision, speed and reliability. The Deer River License Bureau has the answers you need to solve any of your Minnesota registration or titling problems. At Daylily Gifts you will find beautiful unique gifts or treat yourself to something special. We carry a wide variety of jewelry, scarves, accessories, home decor and much more! We’re Located in the combined clinic/hospital main lobby area. HOURS: Monday – Friday, 9 a.m. to 4 p.m. Dial 218-246-4342 to speak with Gift Shop staff. Relax and unwind in our indoor heated pool and whirlpool, or sit in our hotel lobby beside the fireplace and check your email using our wireless high-speed internet access. Wake up to a free continental breakfast, scan the daily USA Today newspaper or catch the weather on TV. We specialize in providing comfortable and affordable accommodations with an outstanding list of amenities. We are located just minutes from many of northern Minnesota’s most popular lakes like Lake Winnibigoshish and Pokegama, and we offer a year-round on-site fish cleaning house. Jurvelin Hardware is a full line hardware store offering hardware, guns, ammo, fishing & hunting licenses and supplies, sporting goods, housewares, DISH Network, and Verizon Wireless service. Full-time agent that specializes in lake homes, recreational properties, lakeshore, hunting land, acreage, in-town homes and commercial properties. Whatever your need, put the power of GOLD behind you. SERVPRO of Bemidji, Grand Rapids & Hibbing is a trusted leader in the restoration industry. We provide 24-hour emergency service and are dedicated to responding faster to any size disaster. With the training and expertise to handle your restoration and cleaning needs, we’re locally owned and operated and can respond immediately to your emergency. C-store, Bait & Tackle,Groceries, Gas and Off-sale. A 4th generation family fishing resort located on Cutfoot Sioux and Winnibigoshish Lakes. Twenty-three modern to rustic cabins with A/C, cable TV, telephone, and Bobbers Bar on-site! KOZY AM 1320/ KMFY FM 96.9/ J105 radio stations serving the greater Itasca area. Supporting sports, community and events. Located in Deer River, MN, we’re a convenient stop for any hunting trip or voyage to Leech Lake, or if you’re just looking for a nice place to watch the game. We serve burgers, sandwiches and some of the best broasted chicken you’ll ever eat. We even offer a Fisherman’s shore lunch, where you bring in your catch and we will cook it. Along with cooking some delicious food, we host a variety of different events, including bike night, special menus for Football Sundays, live music and more. The Northern Star Coop owns and operates the new Cenex Convenience Store in Deer River at the intersection of Hwys 2 & 6, along with the stores in Remer and Long Prairie. Propane Plants in Deer River, Hill City, Northome, Pine River, Walker and Long Prairie. Bulk Petroleum Plants in Deer River, Remer and Backus. In Deer River we also have Northern Star Foods for your hunger needs and 117 Mini-storage units for lease. We are you full service cooperative that pays a cash dividend every year! Blueberry Hills Golf Course is a public, 9 hole golf course & RV Park. We do not take tee times. Golfers tee off on a first come, first served basis. School bus transportation, charter bus and van rental. For your group transportation needs, just give us a call! Fred’s Live Bait and Tackle has been a tradition with anglers fishing the Deer River-Chippewa National Forest Area for 50 years. You’re only minutes away from great fishing spots like Lake Winnibigoshish, Leech Lake, Cass Lake, Bowstring and literally 1000 more lakes in Itasca County. The bait is always fresh and we have the tackle you need to find and catch fish. Law Office Of Shaw & Shaw P.A. The Shaw Law Office represents individuals, businesses and units of government throughout northern Minnesota with the primary service area in Itasca, Cass, Beltrami, Koochiching, Crow Wing, Hubbard, and St. Louis Counties. The areas of practice focus on real estate, estate planning, probate, civil litigation, business-corporate, and municipal and township representation. Full retail store, fresh & smoked meats, fresh & smoked sausages, custom cutting for beef, pork, lamb & more! Catering also available. Northern Lakes Insurance Agency, Inc. Hometown independent insurance agency that’s locally owned & operated for over 40 years! Super One Foods is a family owned business that is proud to serve customers and their communities with low prices and better choices. Since the early 1940’s the Deer River Lions Club has been living up to the Lion’s motto “We Serve” in the greater Deer River Area. Whether sponsoring a swimming program and public park for our youth or providing help with the area food shelf and roadside cleanup projects, the Deer River Lions are committed to making our community a better place. Full service printer offering copies, graphic design, digital printing, offset printing, faxing, plus a full line of promotional items such as banners, mugs, pens, magnets and much more. GIS is an Independent Insurance Agency with locations in Northview Bank Deer River and Grand Rapids. Our agents are knowledgeable and have access to over 50 companies to provide customers with flexibility and affordable coverage options for home, auto, life, health and business needs. Call or visit us online for a free quote. Paul Bunyan Communications offers Broadband Highspeed Internet, Television,Voice, and Smart home services over the regions largest and fastest all fiber optic network. Now in its fourth generation, Rajala Companies produces products of local hardwood and pine, as well as custom projects of all species. Focused both on better forests and better products, Rajalas own and sustainably manage their own lands and work with private and public landowners to manage their timberland’s as well. Our mission is advancing health and wellness in the Deer River area through community participation. We support the future and legacy of Essentia Health – Deer River and other health initiatives in our community. Service organization with liquor sales and charitable gambling. The White Oak Antique Tractor club is an educational and a non profit that is preserving our farming heritage. Meetings are the second Monday of each month at 7 p.m. and tractor show is the last weekend of August! Chippewa National Forest is a National Forest located in northcentral Minnesota, United States, in the counties of Itasca, Cass, and Beltrami. Forest headquarters are located in Cass Lake, Minnesota. There are local ranger district offices in Blackduck, Deer River, and Walker. Itasca Economic Development has the expertise and resources to help you grow your business in Itasca County. Browse our website for more information about our free and confidential services. We are a family run resort with 7 cabin rentals,2 pontoons, boat and motor rentals. We are currently operating mid May thru deer hunting in November. This is a choice family destination with great ‘stuff’ for all ages: great fishing variety on two scenic lakes; extra-healthy, heated saltwater pool; trails; games; 11 comfortable cabins; and much more. All within the very special Cedarwild setting. Located on the shores of Big Turtle Lake, Arcadia Lodge is a Minnesota family resort located in the north-central part of the state, 40 miles north of Grand Rapids, just off the Edge of the Wilderness National Scenic Byway. It is completely surrounded by the Chippewa National Forest. Sparkling clear blue waters, the call of the loon, a soaring eagle and the tranquility of a newborn fawn are all part of the true northwoods getaway that guests experience here. A very quiet 10 cabin resort on a 1400 acre lake which is very under developed. We have boats with motors,pontoons and a 17 foot fishing boat. A wide variety of things for all ages to do. lakeshore or woodland camping for RVs, campers and tents. Now offering free wireless internet. Our prime location on the north shore of Big Cutfoot Sioux Lake (a large bay of Lake Winnie), offers anglers superior access to the best walleye fishing in Minnesota. 14 cabins in a secluded setting, adjacent to Simpson creek trails, perfect for hiking & biking. 600 ft of sugar sand beach and swim area along with a rec program for all ages. Winter cabin rentals available. We are a family owned resort that has been in business for over 60 years. We have 8 cabins that face a small quiet lake, centrally located between Grand Rapids, Deer River, Winnie and Bigfork. Fishing, family, friends and fun! We invite you to vacation at Lakewood Lodge where we offer you a top quality resort on Sand Lake. Our new cabins provide all the comforts of home. Our sand beach, playground, lodge with food, plus great fishing, great hunting, snowmobile trails offer a whole lot of fun! It’s better up north! Located in the Chippewa National Forest. Comfy cabins and spacious campground, childrens activities, splash patio, water trampoline,lodge, restaurant, cocktail bar, arcade, playgrounds,pets welcome. Kids are FREE!! Open year round. Spectacular sunsets guaranteed!! Sand Haven is a family fun & fishing resort on Sand Lake. A mom & pop resort of day’s gone by. Offering affordable lakeside cabins for your family enjoyment. If you’re looking for a lakeside family vacation in one of Minnesota’s spectacular National Forest and all it has to offer with modern day conveniences and old time values, please look to us. Mod. Hskp. Cabins on a beautiful sand beach. Free WI-FI, playground, volleyball, pig pong, free use of canoes,kayaks & bicycles. Boat/motor rentals, gas,bait,pontoon rental. Excellent fishing and family friendly. Perfect summer get- away! Enjoy great fishing and making memories at Bowstring Shores Resort/Seasonal Campground. We offer 13 housekeeping cabins, 13 full hookup seasonal campsites with shower house and laundry, heated pool, planned activities, full service dock. Open year round with fish house rentals and bait on site. Small resort tucked away in the Chippewa National Forest. Open year round! A Minnesota family vacation at Anchor Inn Resort, located on the shores of the Bowstring River near Spring Lake, Minnesota is like a breath of fresh air…literally! Located in the heart of the Chippewa National Forest Anchor Inn offers guests the opportunity to take a break from the pressures of everyday living and fish, hunt or just relax in the beauty of Minnesota’s northwoods. Georgene’s Haven is a quiet family resort located on beautiful Bowstring Lake, in the Chippewa National Forest. We offer seven fully furnished cabins and four campsites with pool, recreation room, camper bathrooms with bait, gas, and oil available. New shower/ bathroom facilities for our camping area. Bowstring Lake has been named Minneapolis Star Tribune’s ‘Lake of the Week’ several times and is known for being one of the best Walleye, Northern and Crappie lakes in Minnesota. Something for everyone! Great fishing on North Star Lake! Plus HEATED POOL+SANDY BEACH+swim raft+rec room+lodge+WiFi+much more. Use canoes, kayaks, Paddle boards & hydro bikes for free! All 10 cabins & 2 lake homes have AC & are newly remodeled. Most are within 20 feet of shore. RV camping avail. Something for everyone! Great fishing on North Star Lake! Plus HEATED POOL, SANDY BEACH, swim raft, rec room, lodge with meals, WiFi,boat launch and much more. Guest use of canoes, kayaks, paddle boards and hydro bike for free. All 11 cabins and 2 lake homes have AC and are newly remodled. Most are within 20 feet of lakeshore. RV camping available. Bowen Lodge is renowned for it’s customer loyalty, prime location & friendly staff. Featured as the Fantasy Village in the Resorts of Minnesota book by Neil Johnson, Bowen Lodge provides an experience that doesn’t disappoint! Come see why our guests rate us #1 in customer service! Located on a peninsula, we offer an affordable, relaxing, and lake experience vacation! We are a family oriented resort and would love to help your family make lifelong memories here! Bass Lake offers a nice variety of game fish including walleye, northern, bluegill and bass. The Deer River Chamber of Commerce welcomes you and your family to our scenic Northwoods Home and the "Gateway to the Chippewa" National Forest. Our many resorts can provide you with your Northwoods experience of choice. Surrounded by lakes, rivers and forests, the beauty of this area and what it has to offer, are sure to fulfill your desires and make your vacation memories last a lifetime. Our business district is continually growing and adapting to fit the changing needs of our community as well as our guests. With many nearby recreational attractions such as golf courses, tennis courts, bowling alley, shopping, parks, casinos, historical sites and landmarks, along with the outdoors activities, you are sure to find something to satisfy you and your family. 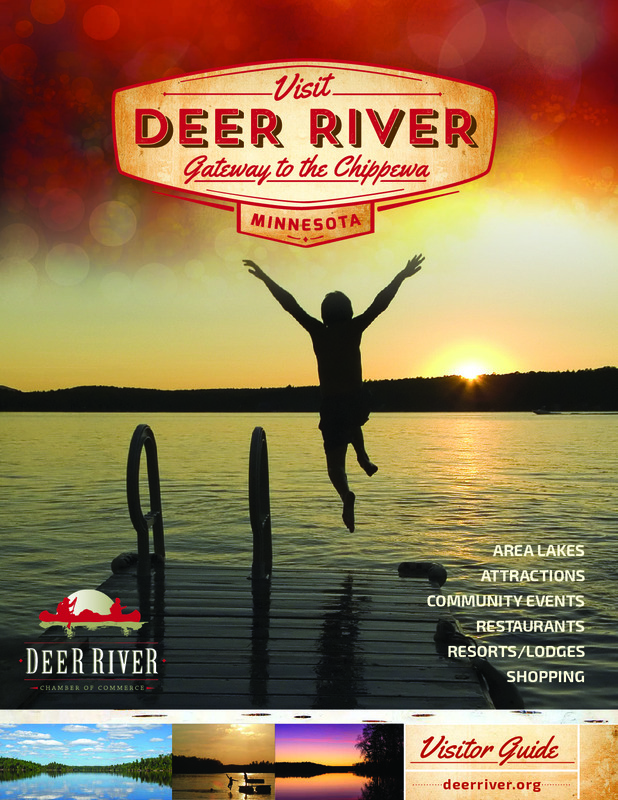 Get your free Deer River Area Visitors Guide.